JAS certified organic broccoli, cauliflower and asparagus, all three cut into bite-size pieces of 3-5 centimeters. They can be eaten as-is, made into a Western-style salad, or cooked with sauce. Vegetables are individually packaged and total 200 grams. 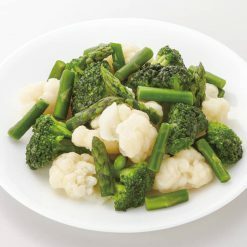 Beautiful organic broccoli, cauliflower, and asparagus pre-cut into perfect bite-sized portions and ready to use in a wide variety of recipes. Makes eating healthy quick and easy — no washing, peeling, or chopping required! Colorful vegetables make a great, low-calorie, low-salt and flavorful addition to any dish. All three vegetables are certified JAS organic and frozen separately for your convenience. Because they come in convenient ziplock bags, desired portions can be removed without needing to defrost the entire bag. Delicious if eaten plain, or easily added to stews, stir-fry, curry or marinated in sauce for a dash of color and style. Broccoli and cauliflower, which are cruciferous vegetables, both contain phytonutrients. Broccoli, cauliflower, and asparagus all contain vitamin C. Broccoli is also rich in vitamins K and A and is a good source of fiber. 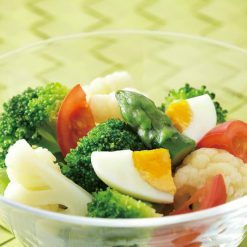 Asparagus and cauliflower have abundant potassium, and asparagus provides folic acid. To make a hot marinade, boil the vegetables briefly, gently dry them, and then marinate them in dressing while they are still steaming so that they soak up all the flavors of the sauce.When making a stir-fry, no defrosting or preparation is necessary! Just add the frozen vegetables to your heated and oiled pan, season, and cook. The same goes for stew or stewed curry — once your stew is seasoned and while it’s still hot, just add the vegetables frozen. The hot stew will thaw them to perfection, and you won’t have to worry about overcooking. This product contains organic broccoli (3 to 5 cm: 40%), organic cauliflower (3 × 5 cm: 40%), organic asparagus (3 to 5 cm cuts, thickness of 8 to 12mm: 20%). Vegetables are harvested in season. They are thoroughly washed and pre-treated at 170-175 °C by parboiling, halting all enzymatic and micro organic activity. Then they are immediately frozen to maintain their freshness and nutrients intact. They are sourced from contract farms under strict standards. Origin of ingredients: broccoli, cauliflower, asparagus (China). Prepared and packaged in China.